After the incredibly successful launch of the GBB Epic drivers it was hard to imagine that Callaway would be able to produce another driver that outperforms its predecessor. The technology in the GBB Epic was revolutionary and despite sounding like a bit of a gimmick when it first launched, proved that the millions of dollars spent on research and design that went into what Callaway called Jailbreak Technology was worth every penny. Well somehow Callaway has managed to further improve this unique technology and use it in the new Rogue drivers. And the results are simply fantastic. The Rogue range of drivers combines this improved Jailbreak Technology with a new colour scheme and further enhanced aerodynamics to offer even more distance and greater forgiveness and consistency on mishits. And this improvement is so significant that almost every Callaway tour professional has made the switch as quickly as they can, showing just how much better the Rogue is than even the GBB Epic. 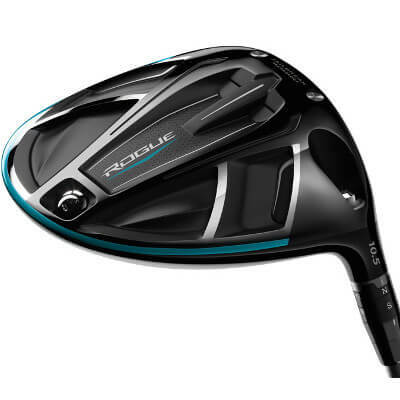 We reviewed the Rogue driver as part of our best golf drivers guide. We’ve scoured the Internet to find the best prices and discounts at these major retailers. It’s not often that a brand launches a new golf club that is significantly better than its predecessor, and one really only reserves such a reputation for PING. But even Callaway, who tends to launch a new driver every year, has managed to hit the nail on the head with the new Rogue drivers, despite launching the highly popular and successful GBB Epic drivers early in 2017. It just goes to show that the technology that went into the GBB Epic drivers was so great, but still had space for improvement and this is showcased in the Rogue drivers. And this time around there are more than just the standard and Sub Zero models, with the addition of a new draw biased model that offers more forgiveness to those golfers who battle with a slice. Fantastic feel and sound that is lower and softer than the GBB Epic and more closely resembles the 816 DBD from 2016. The advanced Jailbreak Technology behind the face makes the entire hitting area more powerful and consistent for better distance and accuracy. The variety of stock shafts coupled with the three different clubhead models makes the Rogue suitable for any golfer. The adjustability allows for more precise custom tuning for the better golfer. There is still a raised aerodynamic section on the crown that can be distracting for some golfers. It is still one of the more expensive drivers on the market despite being the brand’s less adjustable option. Once again it’s Jailbreak Technology that takes centre stage in the Rogue drivers, however, this time a host of new and improved features compliment this revolutionary technology. The Jailbreak Technology is definitely a 2.0 version in the Rogue. The two internal titanium bars that connect the sole to the crown just behind the face have been made into hourglass shapes that are 25% lighter. They work to stiffen the entire body structure and reduce any deforming of the clubhead at impact. These hourglass bars combine with a new X-face VFT face architecture that helps to produce more ballspeed at impact and a more consistent result across the entire area. This means mishits don’t lose nearly as much accuracy or energy as well struck shots. Callaway also uses some of the most premium materials in both the titanium and carbon in the clubhead to ensure better performance and higher quality. The Triaxial Carbon Crown on the Rogue drivers is the biggest that Callaway has produce and extends further towards the perimeter of the clubhead. This reduces weight in the crown without sacrificing any strength and this saved weight is pushed lower and further away from the face resulting in a higher MOI and lower CG. This means the ball will launch slightly higher from impact but with really low spin for longer carry and increased roll. And this is where you do see an improvement on the GBB Epic performance, especially the slightly lower spin on average. The chevron on the crown along with the raised aerodynamic ridges near the face are less pronounced than before making the clubhead look more appealing at address. And while the footprint of the clubhead is slightly larger than before with the face not as deep as previous models, the overall size of the club doesn’t look massive thanks to the curve of the crown towards the rear of the club. This is due to a collaboration between Callaway and aircraft manufacturer Boeing, where the two have worked together to get the most aerodynamic clubhead design similar to that of an aircraft wing. The less friction caused by air travelling over the crown the higher the clubhead speed can be throughout the downswing. Unfortunately the Rogue is still as expensive as the previous GBB Epic drivers while supposedly replacing the more value-for-money XR range. But even with this higher price what you get is an all-around winner in looks and performance with plenty of choice when it comes to shaft options and adjustability. The introduction of a draw version, where more weight is concentrated towards the heel of the clubhead helps to promote a higher spinning draw, is a great bonus for those golfers battling with a slice. And even with the slightly higher backspin rates, the distance is impressive.